A showcase of styles! They’re all good but check out the swagger of the dude at 6:41. Dude at 12:55 with knife is awesome too. Doing some Karate Style movement in a gi. I don’t move like this much anymore and it made different parts of my body sore. At my best, I combine some Karate, Kickboxing, Kali & Silat movement in my carrenza or kembangan, or call it freeform kata! It doesn’t often look like the classical or indigenous manner of movement. After a flowery motion I might jump spin crescent kick into a 1-2/round kick combo, then into a lankha/juru. Yep, it’s a westernization of eastern concepts, but the east can take that and reclaim it back. After all, some of the martial art boxes are artificial and more nationalist that humanist, therefore they can be expanded. 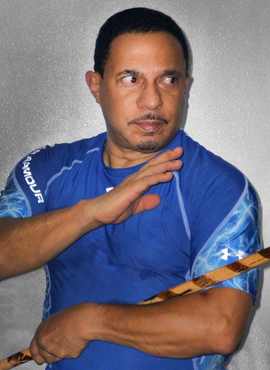 Rick Vargas Kali Silat and Self Defense Training Group. I lead and teach what I call a Kali Silat and Self Defense “Training Group.” It’s not a martial arts organization, school, or even exclusive style. I don’t promote, give belts, or certify anyone. It’s my vehicle for sharing martial arts I have learned and still study, with interested men and women. Admittedly, there is little interest in what I choose to do because so many people are about emblems, belts, certificates, patches, and the whatnot trappings of martial arts. My training group doesn’t even have uniforms, wear what you’d like. What’s a Training Group? Why a training group? Those are often part of being a school or organization. It’s good for the style or organization, but can be a burden on the local instructor who just wants to help others. I can help others with my humble martial offerings. I have past training, knowledge, and skills that cannot be taken away from me, memberships or not. I study, train, and develop martial skills and concepts continually. I have a core of materials I like to teach, from among my own past training and certifications, but it’s not a mandatory set for each student. Sometimes I train one student in one set of skills and another in a different set. Why? Cause I focus on the students’ needs and capabilities. Some want to learn basic no frills self defense. Cool, we can do that. Some want to learn to express themselves through the beauty of martial movement. Some want to learn exotic fighting skills. Then there’s the matter of abilities and capabilities. My older students don’t train in high kicking taekwondo techniques, those take longer to develop skill in, so why require they work on that? But, boy they can whack you with a stick! Mature female students don’t often want to train full contact kickboxing, but benefit from learning how to defend themselves from being grabbed in an elevator from a molester. Some of my students are not athletic, they can’t do 3 minutes worth of a drill all at once, in a self defense situation they won’t win a fight. But I’m not preparing them for the Olympics, they have to train to make one move, their first move, and it be an effective move. School and organizations can’t provide this level of flexibility. I haven’t really trained gun defense. One of my students mentioned he had. I asked him to show me and now I’m learning from him, and can share it to the group. That’s something else a school or dojo won’t do; bring in influences outside of their “Style.” If I think it worthwhile we will fit it in to the training. Another student is a high caliber wrestler. Chatting with him I found he’s of the opinion that someone who is a quality striker doesn’t have to master wrestling like him, that he’d focus on teaching the striker about getting up from takedowns, cause he says, and I accept, a wrestler will get you down! I can’t wait for him to add some of that to the mix. In the training group environment I can customize things more for each member. If someone doesn’t get the 26-31 of the 64 attacks but likes the sinawali’s, we can work more on those. Don’t want to kickbox but do want to learn to defend yourself against a grab punch, we do that on that basis. You like Kali and Silat movement just for fun, I think it’s fun too. The environment of my training group is friendlier and more casual than Karate training in my early days. We could not budge from a stance, could not look around, could not speak or scratch an itch. It’s effective but archaic training I can teach you the same things without terrorizing you in the process, and you’ll learn just as well, if not way, way, better. In my group if you need to go to the bathroom just don’t do it in the middle of defending against a punch, you don’t have to ask permission, need a drink of water, get it. Feel tired, sit out for a bit shame free. Yet, it’s not for everybody. Mercenaries, Seal Team Six, Professional cage fighters, Bodyguards and Bouncers will find this training group underwhelming. It’s honestly designed for the average person who would like to learn some self defense and martial skills, without the stress of the killer training you find in MMA gyms Marine Corps boot camp, or the goofy unrealistic training of the average karate school. It is exciting and often fun. That’s why I run it as a training group. We train, in a variety of things. We converse and laugh. We train with a focus on the individual. We train seriously and for fun. It’s a training group intended for responsible grownups. 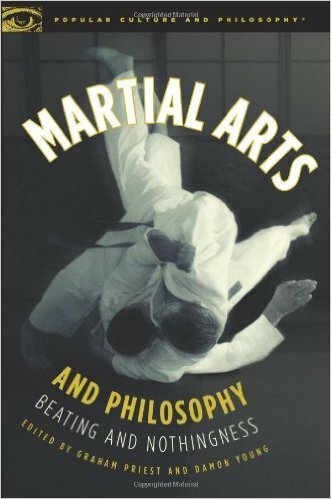 Reading the above book I came across the subject of “Master.” Most martial arts amateurs and novices have a pre conception of what a “Master” is, looks like, how they act and so forth, mostly based on the chop socky movies of the 70’s and 80’s. Practicing martial artists have certain expectations of what it takes to be a master based on their own experiences in the art. However, there isn’t a single defined point or universally established standard at which one crosses over from being a martial arts student/practitioner to a master. There are too many variables involved. A discussion on the subject is a good thing. Martial arts are culturally and continually evolving human activities. Codifying them puts them in the realm of history and causes them to lose contemporary validity. However, in Western Boxing, and even in developing MMA some of the best trainers (instructors/masters) are substantially older men who would have a hard time fighting their way out of a wet paper bag. But, they are “Masters” sought after by the mega million dollar professional fighters. The fighters are the competitive athletes, the trainers are the Masters. So, incredible personal physical skills is not the singular bar by which to measure a Master. An encyclopedic knowledge of the art is also expected; in the book the author calls this the complete knowledge account, which includes “secret knowledge.” A problem with that is that the arts are evolving and the secret knowledge of yesteryear is common knowledge today. Masters also often add and subtract techniques and teachings from the arts as they increase in knowledge as well. They don’t stop learning and developing either. Honestly, I cannot teach someone everything I’ve learned in the martial arts to this day. I am no Master but that amount of material is measured in terms of a life time, my life time. One of the greatest things I can teach is for a student to learn as much as they can in their own lifetime! And their material does not have to match or mimic mine. How do we measure mastery in other fields of study and practice? Part of the misconception with mastery is equating it with performance. If an expert kicker loses a leg is he no longer an expert? Can he not still teach and bring another person to mastery through his experience and instruction? I would suggest that he can, and his mastery is not affected by his lack of ability to perform the particular skill. My own thoughts on the matter include a couple of other things. Age for one. The Japanese/Okinawan Karate traditions had some time and age restrictions concerning masterhood. I believe those are important. Martial arts unlike visual arts become an integral part of a person’s lifestyle. Your martial arts infuse every aspect of your life, how you think, what you value, your disciplines, your perspectives. No so with painting or sculpture. No one under 50 should be considered a Master. I remember in my early days someone who was called “Young Master.” He and his crowd were serious but I considered it a joke. This person was in their mid 20’s, and had some martial skills, but lacked some important life experiences. He could kick better than I, but I had been in the Marines and knew a few things about hurting people he didn’t. In a martial skill sense he might beat me, but in a whole life sense, he wouldn’t have known what hit him. Martial arts and whole life experience are symbiotic. You can’t be a martial arts master and otherwise be an insensitive, uninformed, inexperienced dumbass. You need life’s experiences on love, loss, uncertainty, challenges, and achievements. Those come with time and age. Did I mention I don’t believe in anyone under 18 being a BlackBelt? Black Belt used to signify maturity, not just physical skill level. Then there’s also the matter of Humility. People I’ve known that I would call Masters in any field have been people very aware of their own frailties. These are people who are aware that the universe is expanding and what fit tightly in a box today has a lot of room for growth tomorrow. They learn more every day. They’re aware that art is a spiritual endeavor that has no end. The “Masters” that I see, mostly obese, strutting around grasping their thick belts with tons of stripes for all to see, generally lack this quality of humility. They don’t appreciate that their skill sets are sloppy, slow, lacking power, and they have failing memory. They have banked on their past and not realized that martial arts are about the present, and try to impose their past as a qualification of their mastery. That is not humility and those are not masters.